A few weeks back, Samsung Electronics Philippines Corporation (SEPCO) invited me to spend a night with their 60-inch Samsung D8000 LED Smart 3D TV at Hotel H2O just adjacent Manila Ocean Park along Roxas Boulevard. Samsung D8000 sits at the very top of Samsung's LED TV line. According to the Korean company, the Samsung UA60D8000 LED D8000 Smart TV - shown above - offers an immersive and transformative experience delivered with intelligence and style. The integrated Smart Hub, which allows users to interact with the TV, ensures that everything from surfing the internet to viewing photos and home movies will be effortless and fun. Also, whether users are watching a movie or listening to music, they will instantly notice the superior 3D sound and imaging experience that Smart D8000 LED TV offers. Flaunting a sleek and sophisticated design to match and supreme connectivity for seamless streaming – users have an intelligent and stylish TV to enjoy. "We wanted to remove the barrier between the real world and the TV that is visually distracting: the bezel," shares Mr. Kang Yunje, Vice President of Samsung's TV Design Group. "The design concept centered on the television. If we see the real world in three dimensions, and the TV offers three dimensional images, then everything we see has the potential to be in three dimensions. Designing a slim bezel was about removing the frame that limited our view of the three-dimensional world." It's a great looking TV and Samsung chose an equally lovely room for TP to enjoy it. 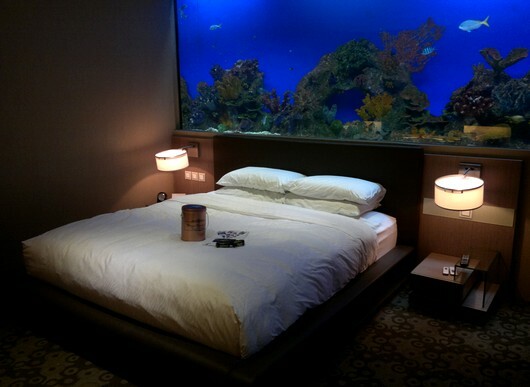 Located just beside Manila Ocean Park, Hotel H2O literally lets you sleep with schools of fish! 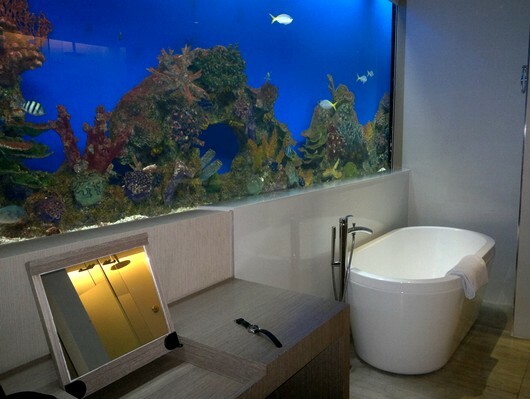 You'll be amazed at the aquarium wall of each room, filled with colorful man-made corals and various species of fish! If you want to book a room, give Hotel H2O a ring at +632 2386100. Yes. Those are live fish. 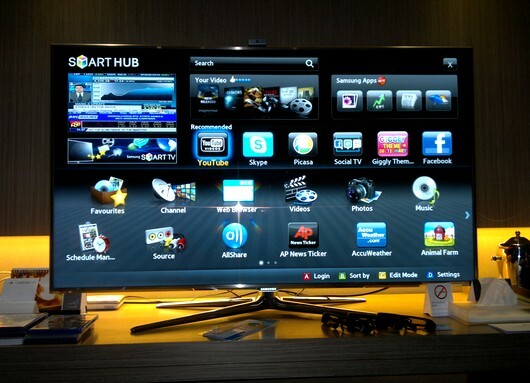 If you remember, last September, I reviewed the 64-inch Samsung D8000 Plasma Smart TV. The features of Samsung D8000 LED Smart TV are largely similar to the Plasma version except that it's thinner and perhaps more energy efficient, which reflect some of the true benefits of LED display technology. 1. Design - Nothing but praises for Samsung D8000 LED TV's almost bezel-less all-screen design. I think the high-gloss metal frame and stand perfectly compliment the ultra-clear and vibrant display. Likewise, these accents make the TV go well with any modern interior design and decor. If I were to describe D8000's design in three adjectives, they'd have to be stunning, classic and subdued. 2. Picture Quality and Viewing Angles - As probably the best LED TV that Samsung currently offers, D8000 comes with all the latest technology that help give viewers the best picture quality possible. Given this TV's hefty Php 319,900 price tag, I expected nothing but the best from it in this department -- and you'll feel relieved to know that it totally delivered. I find that all the latest display technologies by Samsung work together to make D8000 one of the leading TVs when it comes to display quality. There's Micro Dimming technology, which delivers outstanding contrast ratios with deeper blacks and purer whites. HyperReal Engine and the LED backlight, on the other hand, enhance images and make them appear crystal clear. There's also the Wide Color Enhancer Plus technology making colors more life-like and reveal hues and tones invisible in less-advanced displays. 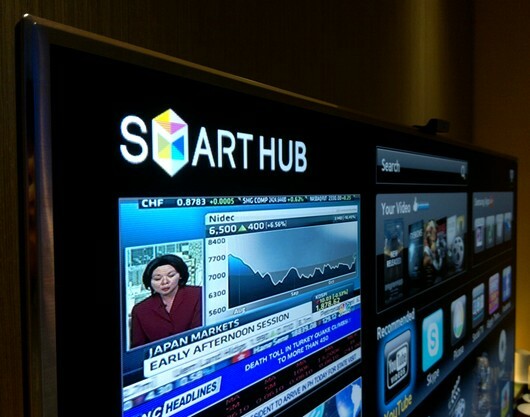 Smart Hub on Samsung D8000 allows users to browse the web, access Facebook and Twitter, watch Youtube videos, make video calls via Skype, and even play a few games and apps right on the TV! It even lets help you find TV-related content online and lets you share movies, music and photos with your friends online. I think the best thing about Smart Hub, aside from letting you update your Facebook status while watching a flick (so you can let everyone know that you're watching a 3D movie on your D8000), is the Youtube app because of the vast number of HD content that can be accessed for free. I tried watching several Full HD movie trailers and - of course - the experience was unlike anything I've experienced on a laptop or other smart TVs before (duh). Having tried out other top-tier 3DTVs in the past, I'm not sure if Samsung D8000 is indeed the best TV in this specific department that you can get right now. Nonetheless, it does come with a number of 3D technologies that greatly enhance viewing experience. There's 3D HyperReal Engine - which makes images more crisp and vibrant, 3D Sound - giving cinematic sound effects, and real-time 3D converter, which turns 2D content to 3D instantly. Overall, when it comes to 3D, I'd say it's just alright. Samsung D8000 has this feature called AllShare, which lets you wirelessly connect to compatible devices - like Samsung smartphones, tablets or netbooks - to access content. I realized while playing with it that it's a feature that could be useful in family reunions or house parties; Say, before everyone goes home, gather all of them in front of your TV and show them some photos and videos that you took from the event using your smartphone. Should be fun, eh? 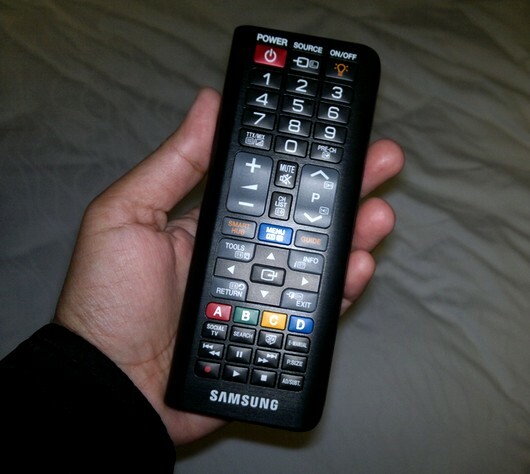 Samsung LED TV D8000 comes with this 'two-faced' remote control. 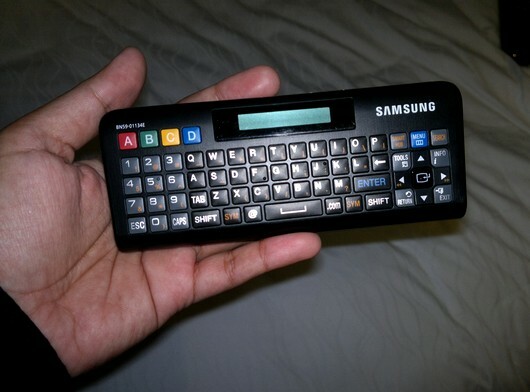 The QWERTY keyboard, which lets you type faster, should come in handy when browsing the web or accessing your social networking accounts via Smart Hub. This layout is more familiar; Perfect for days when you just want to watch TV. To wrap this up, I'd say that Samsung LED TV D8000 is a trophy TV; Yeah, that's what it is. It's for people who want to exude that aura of always wanting nothing but the best that money can buy and that they can actually afford to get such things... just like that.